Okay, not so Silent Sunday, but feel it needs a little description. 🙂 My b-i-l recently bought a home and is completely renovating it. So he just bought all new appliances and gave us all the boxes for Cody. Greg taped several of them together and made a very long "tunnel hideout". This picture really doesn't do it justice. It is approximately 15 feet long. Yes, almost half of my family room length is covered by a tunnel hideout. And, I wouldn't have it any other way. It’s kid heaven to have tunnels like that. Too fun! My son would be in box heaven! Ha! I would have loved to have one of those in my living room when I was a kid. 🙂 How fun! @Lolo – He IS in box heaven. lol. That os so cool! My kids would love it too! How much fun is that?!!! My son would love this! That is so cool, I love little minds! Aww how fun! 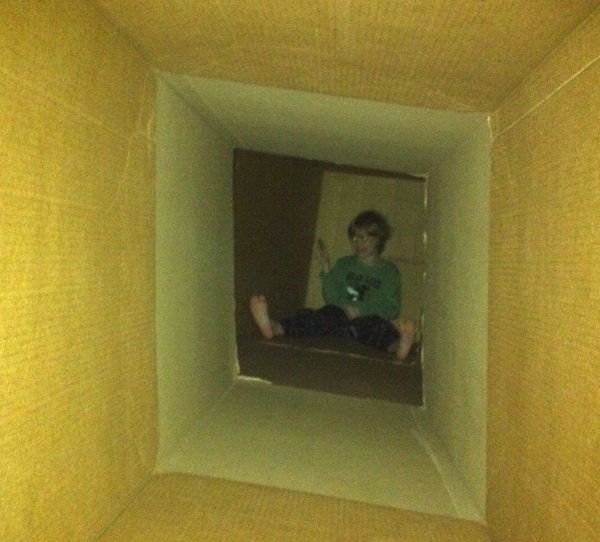 One of my favorite memories from childhood is when we were about to move across country & my older sister took all the empty boxes & filled the WHOLE ROOM with a "maze" of them. I was five so it was the coolest.thing.ever. That’s great. I don’t have the room to do that. I remember when my kids were younger, boxes were their favorite. That is totally fun, my boys use to love doing things like that! I would do the exact same thing! That is the coolest! boxes make kids so happy. That was my favorite thing to do when I was a kid too. that’s such an awesome hideout! How fun. My kids would love that! I love that it’s the simple things that amuse kids the most. I told you this was cute! LOL that is a great hideout. Awww! That is awesome! TOTALLY a Kid paradise!